Our mission is to seek, gather and create, quality offshore passage opportunities for our members. Delivery skippers and private boat owners quickly realize their friends and family have jobs and cannot always sail with them. So they call us looking for crew. 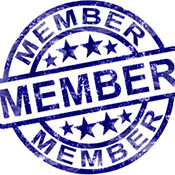 We collect their information and pass it on to our members to help them get aboard. Since you are helping to deliver a boat, you get to go sailing for free. Many are repeat skippers or members so we pre-qualify a majority of the opportunities for you. Hear from Hank Schmitt, Founder and CEO of Offshore Passage Opportunities, how crew can find boats, and delivery skippers can find qualified crew. 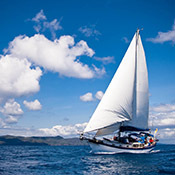 We offer a free service to boat owners and skippers. We will be happy to help you get free crew that will pay their own way to and from the boat. Normally the owner pays for all onboard food and boat expenses. If you are looking for crew on short notice expect to help pay for some transportation costs if you want to get qualified crew. We reserve the right to refuse to post information if we do not have enough information or feel the passage is unsafe in any way. Please do not hesitate to call if you have any questions. In an effort to keep everyone informed, below is a summary of the upcoming and recently concluded events. See how Hank recently helped Dive Master and dive shop owner, Fabien Honore, acquire a new Aiken Dive Compressor from Newark, New Jersey. Hank also helped PAYS acquire new bottom paint and new mooring lines. Read more. Almost immediately after your sending out my crew request, I received 6 qualified responses. Through Christmas Eve and day, I have received an additional 4 responses. In a word: Wow.... This is a terrific service that you are providing. Thanks a ton for your help. I received a lot of responses from very capable seamen and have filled out my crew. You run a very good organization and I have given your contact info to a couple of broker friends of mine. Great job! The response for crew has been fa-nominal !!! I just wanted to say "thank you" and I am sure we will have crew thanks to you. Keep in touch. The OPO announcement we put out earlier this year produced several very well qualified crew for my voyage from Annapolis to New Zealand. I’ve filled my crew needs from Annapolis to Galapagos and have one crew for the remainder of the passage to New Zealand, but I would like one or two more for Galapagos to New Zealand. Hi Hank! Just saying "Ahoy". Your OPO has changed my life, I showed off my sailing passage list to a friend the other day and he was impressed, I was too! So nice to get to see you again — and to get a look at Avocation — in Newport and in Bermuda. You and OPO are responsible for me racing with Marcus, and I’m grateful. In the last 8 years or so I’ve gone from a pretty novice cruiser to steering a race boat at night through 30 knot squalls and big seas! Thank you for all you do to create sailing opportunities for others and to create such a creative community. When I first called you I could have never imagined what OPO would mean to me. I have lifelong friends and lifelong memories. You make everyone feel welcome and valuable. Thank you! I appreciate you!! Hi Hank, First of all, I would really like to thank you for your kindness. I have been emailing and calling every contact I could find since November, and no one has come close to being so genuine and helpful as you have been in just this one email. It really means a lot to me that you would be willing to put in your own time, energy, and offerings into helping me pursue this journey. I think it is so cool that you were able to participate in such an intense level of competitive sailing at the age of just 18 - that must have been such a great experience. Just wanted to let you know that NARC 2018 was a great experience. To me, the combination of Jonathan and the Swan 60 represented the absolute best in offshore passage making. I was very fortunate to be part of the adventure. Thanks for the opportunity, you and Jon have one big thumbs-up from me. I look forward to a long association with OPO. To view additional testimonials, please click here. If you've ever considering deepwater sailing but were not sure how to jump start your sailing career, our Swan Program is for you. 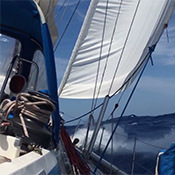 Our Swan Pogram was specifically designed to introduce people to the world of offshore sailing by providing hands-on crew experience under the watchful eye of an professional skipper on a proven boat. During your tenure onboard, you’ll learn to keep watch, make log entries, navigate, use the radio, steer the boat and perform tasks that are essential to safe offshore sailing. The Swan Program offers a fixed price for everything you’ll need aboard—you just pay for your travel to and from the boat. The Swan Program sails south from New England to Bermuda and the Caribbean in the fall, and north from Bermuda and the Caribbean to New England in the spring. Summer trips are also available. After your first Swan Program experience, you’ll have the skills to sail on other boats. Please view the video below to learn more. 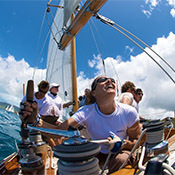 May Swan Program – Many people have already asked about the May Swan trip sailing from the Caribbean to Newport at the end of the Caribbean season. We always give OPO members the first opportunity to join us since there are a limited number of berths available and they may fill up quickly. For those that need to and want to plan ahead we are publishing the dates and taking $500 deposits to reserve a berth with us next May. 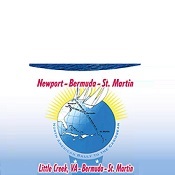 We will most likely sail from Nanny Cay Tortola BVI to Bermuda and then to Newport, but don’t make any plane reservations yet as we need to get confirmation from the World Cruising Club that the marina will be in place. The back-up plan would be to sail from St. Maarten to Bermuda and then to Newport not in the ARC USA. If you want to place a $500 deposit, please visit our online store or call Hank in the office at 631-423-4988. Arrive in Newport Saturday May 20th and Huntington NY Sunday May 21st. The cost all-inclusive is $3,000 per person. 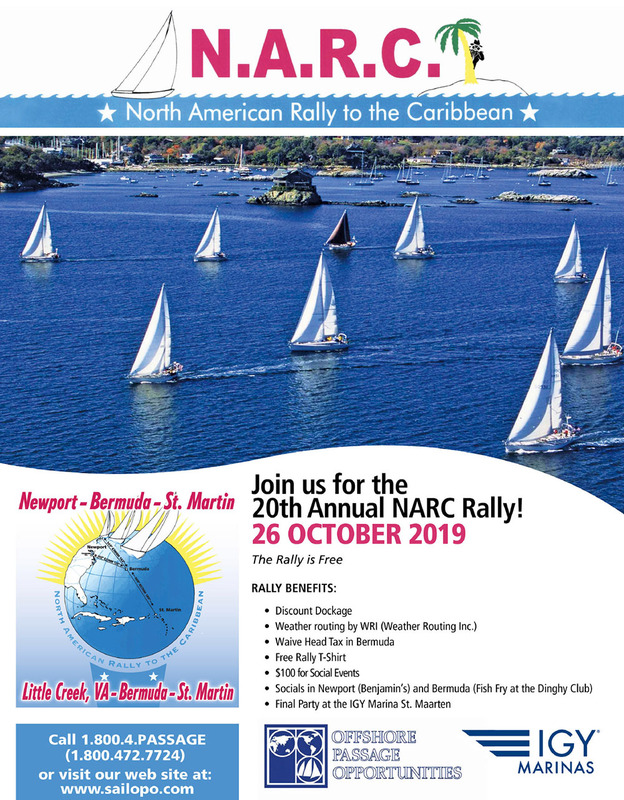 The NARC Rally started in 2000 when organizer Hank Schmitt was moving a fleet of Swans from Newport, RI back to the French side of St. Maarten in the Caribbean. Since Hank was in charge of providing 10 skippers and crew to move the fleet he decided to invite other boats to join in an organized rally departing from Newport in the Fall. We have made the annual passage ever since. Read our NARC 2018 recap -- it was an absolute blast. If you have any questions please feel free to call Hank anytime at 631-423-4988.